I’m afraid I’m a sucker for stories; including those about history. Here are a couple of stops we made yesterday, while cycling to the east of our lodging in Kvarnbo (Saltvick) in Åland. By the way, if you are wondering how to pronounce the place we are cycling around, think of the word AWL and add “land.” It is as if you are forming the letter O with your mouth but actually vocalizing the letter A. Say it with that initial vowel sounding like, if you’d never seen it written, the hearer would not know if it was spelled with an initial A or an initial O. Anyway. 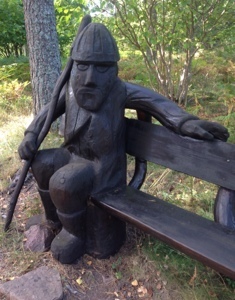 Here was our first stop – ancient, Viking history. A high concentration of pre-historic structures can be found on Borgboda Farm as well as remains from Medieval times. The oldest finds date back to the Bronze Age but the area is dominated by remains from the late Iron Age (400 – 1000 AD). These include four cemeteries, a hill fort and extensive layers of refuse. Excavations have also revealed the foundation of a building as well as traces of pre-historic farming. The hill fort, enclosing an area of 6 acres, was situated at the center of Åland’s then most densely populated area. Excavations have indicated that the fort was not permanently manned but rather served as a refuge for the population in times of unrest. Grave mounds from the late Iron Age. The Ängisbacken cemetery comprising 65 grave mounds, is typical of the late Iron Age. In the pre-Christian tradition, the dead were cremated with a few of their belongings. The ashes were then buried and covered with stone and earth, forming a mound. A cemetery, which could be used for several centuries, usually represents the population of one farm. Two of the graves in this cemetery, which were excavated in 1985, were dated to the late Viking age, around 1000 AD. Enclosing an area of six acres, the hill fort is the largest of Åland’s six hill forts. Placed in a rock with steep northern and eastern sides serving as natural defenses, it only required defensive walls to be built on the southern and western sides. The low stone walls, which are double at the main entrance, ought to have served as foundations for further woden constructions. Inside the fort can be seen the remains of several building foundations. Second stop, Bomarsund, where a rare military alliance among British, French, and Turkish armies defeated the Russian Empire. Åland became part of the Russian Empire in 1809. Prior to this, the islands, together with mainland Finland, belonged to Sweden. The Russian period lasted until 1918. 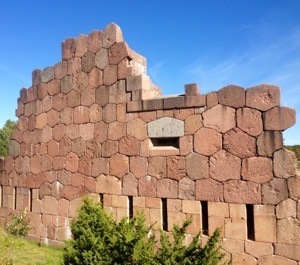 The Russian fortifications at Bomarsund included some of the largest buildings ever constructed on Åland, and were the center for the most significant military occupation in the islands’ history. The fortress represented not only Russia’s military authority, it was intended to change the very nature of Åland: from an island group populated by fishermen, farmers, and coastal traders, to a fortified outpost of the Russian Empire. The planning and building of Bomarsund continued for 45 years. The Main Fort would lie in the center of a great circle of defensive towers and other buildings. 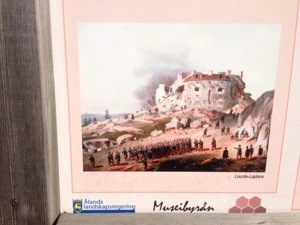 But when Bomarsund was attacked in 1854, only 25% of the planned work had been completed. The enormous size of the proposed facilities was the fortress’s greatest weakness. A small but significant society grew around the fortifications. The population comprised merchants, craftsmen, and civil servants, together with their families. They came from every part of the Russian Empire, including Åland. They lived in planned residential areas, where the cosmopolitan lifestyle was quite unlike the traditional Åland lifestyle. This society was dominated by the military and its fate was closely tied to that of the fortress. In 1854 Åland was caught up in a war fought between Russia and the allied forces of France, Britain, and Turkey. A powerful fleet, together with troops, attacked Bomarsund. Following a short battle, it was captured. A few weeks later the fort and other buildings were demolished. During this battle the residential areas around Bomarsund were also destroyed. When the war ended, in 1856, Russia was forced to sign a treaty that led, amongst other things, to the demilitarization of the Åland Islands. Where the walls of Bomarsund once represented Russia’s military authority, today they symbolize the autonomous Åland Islands. During the attack of 1854, the Main Fort was attacked from both land and sea. The defenders did everything they could to hinder their attackers, but it was simply a matter of time before the Main Fort lay in ruins. 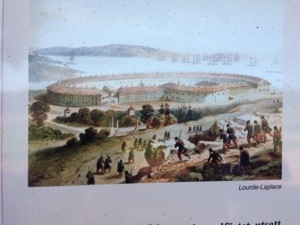 On the 16th of August, following a 24-hour bombardment, the fortress’s commander, Major-General Bodisco, surrendered and he and his troops were led away to prison in France and England. The Orthodox Church was the most beautiful part of the fortifications. Religion was an important part of the military’s day-to-day life, but not everyone at Bomarsund was Orthodox. Bomarsund was a multi-cultural society with Catholics, Protestants, Jews, and Muslims, as well as the Orthodox Christians. The main fort was like a boundary town, with offices, bakeries, churches, a prison, wells for drinking water, and toilets. It is the largest building ever to have been built on Åland, with a total of 246 rooms (over 18,000 sq. meters of floor space), accommodation for 2500 people and places for 115 cannon. 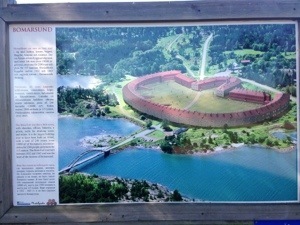 The main fort was built between 1832 and 1843, and was the heart of the fortress of Bomarsund. During the attack of 1854, Brännklint Tower was the only part of the landward defenses to have been completed. Thousands of French soldiers armed with cannon and rifles assaulted the tower. For 24 hours, the 140 occupants struggled to hold the enemy at bay. The number of casualties mounted. Finally, the decision was made to abandon the tower and blow it up. While the charges were being laid a French force managed to enter the tower and capture the few soldiers that remained.